Long story short, a friend of mine invited two friends (me being one of them) on a celebratory vacation as she has just graduated from grad school. about two weeks before the actual trip, we booked everything and it was one of the most fun spur of the moment trips I've taken! Below, I will talk about what we did, what we saw and a few insider takeaways for you to have should you ever decide to go to Croatia! Our home base in Croatia was Split. This is where our Airbnb was (shoutout to Lovre who is a great host)! The apartment was spacious, had great amenities and was a 5 minute walk from town. We did a lot of eating, shopping and connecting with our tours in this area. More on each island and shop my looks below! The main attraction of Split is the Riva. You can access Diocletian's Palace, which is amazing in architecture and has so many cute vendors inside. It's like walking through history (and a maze). One of the main streets is Marmontova Street, which has all of the stores and a view of the Riva. Also, we found our go-to candy store of the trip as well! It takes about 8 minutes to get from the top of the street to the bottom. On one of our first days, we walked to Marjan Forest Park and rented bikes right at the entrance. This helped us learn the lay of the land a bit. We followed the park bike path until we got to Kasjuni Beach where we camped out for the day and had a few drinks at the beach bar. The port and bus station sits right on the Riva, giving easy access to get to other islands. We used Pelican tours to do a 5 island tour and excursion to Krka Waterfalls + wine tasting, but I'll do an entire section on tours below! Jadrolinija was the ferry company that we took to get to most islands without tours. For breakfast, there are tons of random bakeries throughout town, but our number one stop was the juice stand called “Juice Bar” right on the Riva. For Lunch, Pikanterija for on the go sandwiches is the move (open until 12 so great for late night food too)! For dinner, we loved Chops Grill (meat and seafood). The Bass, Bruschetta and Burrata are amazing (3 Bs). We truly went there 4 times in 7 days. So good! There are tons of bar crawls, but we loved the Crozzies bar crawl (Crazy ozzies). We paid the equivalent of $18 USD for unlimited drinks and pizza from 9-11pm at the first bar and move as a group to following bars. Each night has a theme! We even made it to the Crozzies Facebook page! 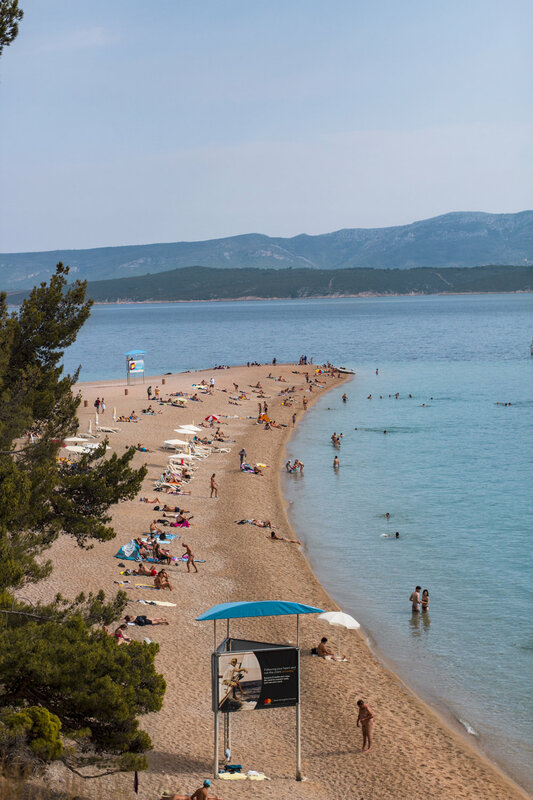 There are tons of activities to do on Brac, which is only a 50 minute Ferry ride from Split. We were on a deadline as we needed to get back to Split to meet up with a friend, but there are tons of restaurants in the boat town and transportation options right off of the ferry. Naturally, we rented a quad/ATV to get around the island. Word of advice: GET THE STRONGEST ONE! We didn’t and ended up taking longer to get from point A to point B. We motored to the other side of the island to get to Zlatni Rat Beach. The views all the way to the beach are unreal. The entire drive is pretty much on the coast line, so as you drive up the mountains and around the windy turns, it truly feels like an adventure ride! Funny story: On our way back, we were running late to make our Ferry, thus missing it by 1 minute! As we sped in to return our ATV, we could literally see the ferry pulling away. Luckily, they leave every 45 minutes, so we sat in town and laughed about it over some gelato and the sunset. We traveled to Hvar on two occasions, both of which were somewhat of a surprise and very mellow. Hvar is what you see in the pictures! A mountainesque terrain with traditional Croatian architecture including the orange roofs and neutral paint job. A castle resides at the top of the mountain with blue skies above it and sail boats in the port below it. Hvar is a great place to wander! We found cute shops and restaurants once you start moving into the alleyways and narrow corridors. It almost felt like Italy! There is a sand beach on the opposite side of the island from the ferry drop off, but we couldn’t get our hands on a few bikes to get there. Instead, we walked the perimeter of the island until we found a hidden staircase to the coast line. This is where we set up shop and tanned until we had to go back. There is a ladder to get in and out of the water, which was great! We didn’t do too much eating on the island, but there were a lot of restaurants right off of the ferry. For this trip, we had 3 excursions panned. One to Krka Waterfalls + wine Tasting, one to the Blue Caves + 5 island tour and one to Mostar, Bosnia & Herzegovina. All were great, but some doable on your own. Pelican tours ran our Krka Waterfalls and Blue Cave tours, which were amazing! I will say, when you go with a large group, there will always be lines. I recommend renting a car to get to Krka Waterfalls so that you can be there early and beat most of the rush. We arrived at primetime, so it was a little packed, but the walk through the National Park was gorgeous! There were so many smaller pools of water and greenery around. The wine tasting was lovely as we were bussed to the location. We tried a local families red, white and rose wine with a side of bread and cheese. It was a long day but nice to see the Waterfalls and get some wine in us! Hands down, our day trip with Pelican Tours to the Blue Caves + 5 other islands was our best day of the trip. Not only did we see the Blue Caves (which are blue due to the reflection of the sky on the white sand ocean floor), we also saw and went into an additional cave on our way to the next island. Each stop after that lasted about an hour and a half. From there, we stopped at a small island called Vis with super interesting stone and a beach bar followed by a tiny beach just to see it (got a little too crowded) and an island right off of Hvar, which is home to Carpe Diem Club & Restaurant. Carpe Diem had great lounge areas, easy access to both sides of the island and a lunch spot. The food was not great, but the location, interior decor and vibe made for great pictures and relaxation. We saw several Dolphins on the way and were able to use boat taxi time for tanning! Our last stop was Hvar before heading back to Split. We were a little tired, so we took this opportunity to take a sun nap. We found another staircase to the coast like the one I mentioned above in the Hvar section and camped out there until it was time to go. Overall, this day was definitely one of our favorites and you get your monies worth with this tour! This excursion was a fun little day trip into another country! It took about two hours to get from Split to Mostar and there is enough to see on this excursion for it to be worth it. It was interesting to see the contrast in culture from Croatia and even cooler to learn about the Old Bridge. It is proof of manhood for a boy from Mostar to jump off of the 25 meter bridge into the river. People gathered around as tourists volunteered to jump as well (for a mere 35 euros). The town is full of shops and great food with a lot of flavor. I will say that we went with a tour guide, but really didn't need to. It's more cost effective to rent a car and drive yourself. As long as you have gps, you should be good! Resting a car for a day or two is pretty cheap in Europe!